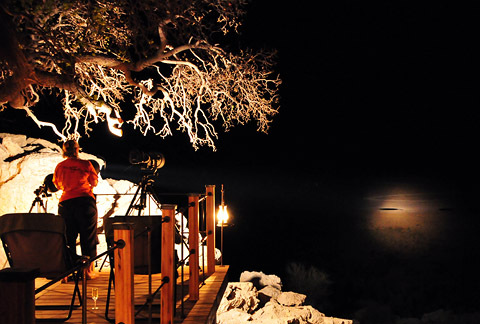 Jenny using the Lightforce 240 spotlight at Kambaku River Lodge - shining across the Crocodile River and spotting a leopard. Distance here is around 180 meters. 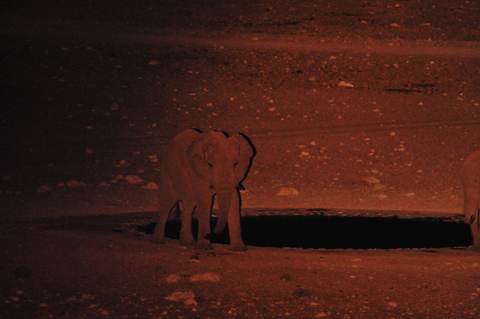 We enjoy photographing animals at night and in some game parks the waterholes or rivers are quite close to the camps or bungalows while at others thay can be in excess of 200 meters away - hence our quest to find the best safari spotlight. Back in 2000 we tested many spotlights and found the Lightforce Blitz 240 (with 100w halogen bulb) to be the best safari spotlight in terms of beam penetration and reaching subjects that were up to about 120 meters away. In the last few years there have been many advances in light technology and we have been reading reports of led torches that claim well over 5000 lumens and spotlights that claim over 10 million candlepower so we did a bit of research and decided to try the closest competitor to the Lightforce Blitz 240, namely the LED Lenser X21. We were extremely disappointed in both the torch performance and the service from the local distributor. We were, however, very pleased to see that Lightforce have brought out a new Blitz 240 spotlight using XENON HID bulbs, which we feel allows Lightforce to keep the title of 'best safari spotlight' by far. 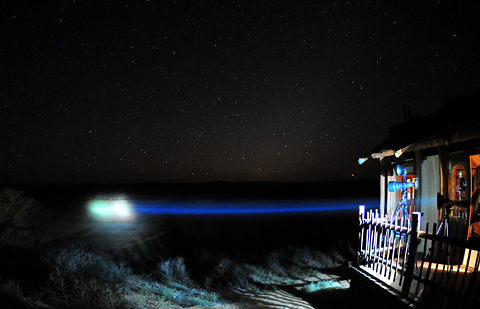 We put the new spotlight to the test in both the Kgalagadi and Etosha. In the Kgalagadi most waterholes are close to the bungalows such as Urikaruus, Mata Mata, Grootkolk, Nossob and Gharagab - they range between 50 and 80 meters so most spotlights can reach them. The challenge is in camps such as Kieliekrankie and Kalahari Tented Camp where the waterholes are further away - 120 meters and 200 meters respectively. My camera struggled to focus due to the distance and the yellow beam. 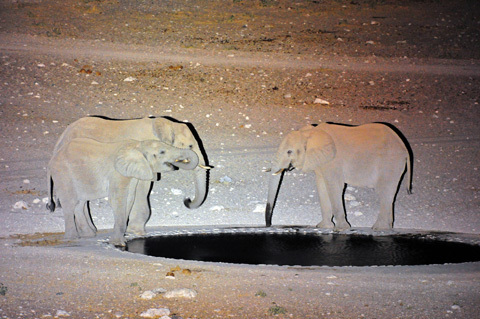 The beam cut through the darkness and lit up the waterhole allowing us to photograph animals, like these elephants, with no flash. The Nikon SB900, even with a Better Beamer, does not reach these distances, thus forcing us to shoot with just the spotlight providing the light - hence we need the brightest and whitest light! 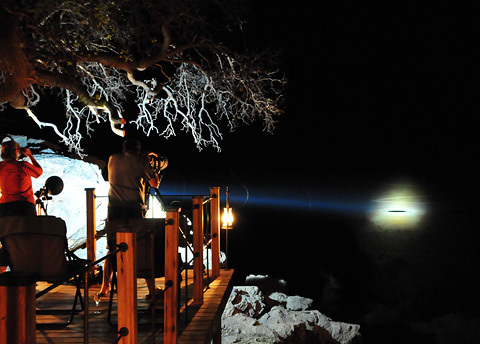 The beam even reached the road leading to the camp, which is one kilometer away - now you can see why we call this the best safari spotlight by far! The new Lightforce Blitz HID (High Intensity Discharge) spotlight differs from the old model in that it has an internal 35w, 55w or 70w ballast enclosed within the base. The bulbs have been designed by Lightforce exclusively for use with their parabolic reflectors providing extreme light penetration. We also like the fact that the color of the light has gone from yellow to white (5000°K), more accurately matching daylight. Candlepower is the most useful measure of illumination in a particular direction. Lumens are most useful as a measure of total illumination, that is a light source shining in all directions, like a light bulb lighting up a room. For nocturnal game viewing we do not want to light up the whole area - just the subject, hence candlepower is most useful to us. Please keep in mind that neither extreme is good as a very wide beam spreads the light too much and a very narrow beam will light only a small part of your subject. Lux are most useful to indicate the density of light that falls on a surface. This can be measured with a light meter taking a reading off the subject that your spotlight has illuminated. You are in a dark room that has one window with a set of heavy curtains that has a small hole. A thin beam of sunlight is shining through the hole and falling on a table. That beam of light represents high candlepower, but low lumens. If you looked through the hole into the sun it would hurt your eyes but there isn't enough light to light up the room. The amount of light falling onto the table is measured as lux. If, on the other hand, you switched on a normal table lamp, it would brighten the whole room even though it is not even close to the brightness of the sun - low candlepower yet high lumens. Again, the lux would be the density of light falling on subjects that have been lit by the table lamp - those closer to the lamp will have more light density than sujects further away from the lamp. 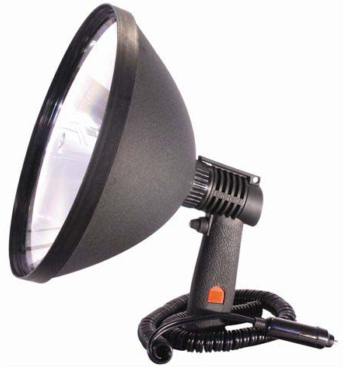 The Lightforce Blitz 240 HID uses a large parabolic reflector to take all the light (lumens) produced by the bulb and throw it as a beam (candlepower) to produce dense light (lux) on your subject, thus currently making it, in our opinion, the best safari spotlight in the world. Added to that excellent performance is the 5-star service and backup from Lightforce Australia and from our local distributor, Lynx Optics, to make the Lightforce spotlight unbeatable.